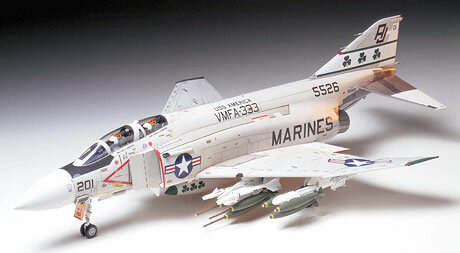 << Back TAMIYA "McDonnell Douglas F-4J Phantom II Marines"
TAMIYA "McDonnell Douglas F-4J Phantom II Marines"
When test pilot Robert C. Little prepared to take off in the YF4H-1 prototype on May 27, 1958, few onlookers could have guessed at the success story yet to unfold. Over thirty years from that faithful day, the successors of that prototype, the Phantom series of aircraft, would be protecting the skies over the free world and see adoption by eleven nations including the U.S. Navy, Air Force and Marines. The Phantom II was developed by McDonnell Douglas and first pitted against Vought's F8U-3 Crusader III to see which aircraft would be the Navy's next main carrier-borne fighter. In 1959, the selection was made in favor of the robust Phantom II. The early production model, the F4H-1F, underwent various tests and training exercises, eventually leading to the F4H-1 model, which was deployed to several Navy and Marine divisions. In 1962, in efforts to unify the names of Navy and Air Force aircraft, the F4H-1F and F4H-1 became designated the F-4A and F-4B respectively. Just after its adoption by the Navy, the Phantom II showed the world what it was made of, breaking record after record, including top-speed, altitude, and time-to-climb. To top off these results, the U.S. Navy ran Project LANA, a transcontinental speed race. The roman L stood for the number 50, for "50th Anniversary of Naval Aviation". The contest was to demonstrate the Phantom's shocking speed and reach. Based on this impressive track record, and on comparative tests against Air Force fighters at the time, it was decided that the next main fighter of the Air Force would also be the Navy's Phantom II. The F-4B version was specially tailored to the needs of the Air Force, and became designated the F-4C. Further improvements to that aircraft resulted in the F-4D model. The Navy continued to make improvements to the Phantom II. Mounting the F-4B with an automatic carrier landing system, yet another variant, the F-4G was born. On May 27th, 1966, perhaps the best known of the Navy's Phantoms, the F-4J, made a successful maiden flight. It housed powerful General Electric J-29GE-10 turbo jet engines, the powered-up version of the J-29GE-8 engines used on the F-4B and F-4G. It was also fitted with an AN/AWG-10 radar on its fire-control system and an ASW-11 one-way data-link. Stronger landing gear of vacuum-melted steel fitted with wide tires were added to meet the strict sink rate requirements, and the top and bottom surfaces of the inner wings were slightly bulged out. The Navy's foremost requirement being improved takeoff and landing, the F-4J was added a slot to the stabilator leading edge, which provided tremendous down force at low speeds. This Phantom II was capable of carrying a maximum weapon load of about five tons, which gave it a truly powerful punch. 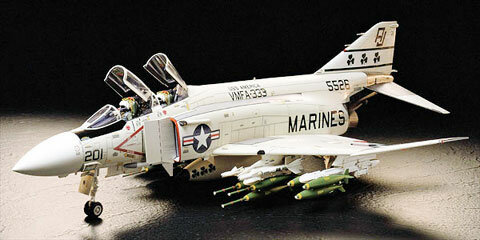 Its main air-to-air armaments consisted of AIM-7 Sparrow and AIM-9 Sidewinder missiles and a 20mm gun pod. AGM-12 Bullpup and AGM-84 Harpoon air-to-surface missiles, as well as various bombs and rockets were also loaded in great numbers. In 1966, the 101st Fighter Squadron of the Navy became the first to be outfitted with the F-4J. Deployment to the Marines soon followed in 1967, with F-4J aircraft outfitting the 334th, 232nd, 235th, and 333rd Fighting Plane Squadrons. As the deployment of the F-4J to the Navy and Marines continued through 1967, U.S. involvement in the Vietnam War was getting deeper and deeper. Back in 1961, the U.S. government decided to send their troops to Vietnam to support the South Vietnamese government, but the chaos only worsened. It was the carrier-borne Phantom II that launched the air battle, engaging the MiGs of the North Vietnamese. In late May of 1968, F-4J aircraft from the Navy's 33rd and 102nd Fighter Squadrons arrived at the Gulf of Tonkin aboard the USS America. The Navy's Phantom II headed for North Vietnam for roles in bomber support and anti-MiG patrol. This jack-of-all-trades aircraft was equipped with Mk.82 bombs and Sidewinder missiles for self-defense, and often served as effective close support for the ground forces of the Marines. The service of the F-4J in Vietnam is highlighted by one particular episode. On September 11 1972, Major Thomas (Bear) Lasseter and Captain John D. Cummings of VMFA-333 "Shamrocks" shot down a MiG-21 near Hanoi, the only time in the war that a MiG was downed by a U.S. Marine aircraft. That F-4J was later downed by a SAM (surface-to-air missile), but the pilots were later rescued. The production of the F-4J ended in late 1972. However, because the development and deployment of its successors, the F-14 Tomcat and F/A-18 Hornet were late, about 250 F-4J planes were equipped with the latest fire control devices and engines, and later designated F-4S. These aircraft remained in Marine use until 1991. Battling in five major conflicts spanning over three decades, and breaking almost every conceivable aviation record, the highly versatile Phantom II earned a special place in warplane history.